ALL application materials are to be submitted directly to the Graduate School online. Directions are posted in the online application. Do NOT send letters of recommendation or essay to the Communication Disorders Program. The Communication Disorders Program at Eastern Kentucky University offers a Master of Arts in Education. The M.A. Ed. in Communication Disorders is a 63 hour degree program, which only begins in the Summer semester. In addition to academic coursework, students must complete 400 clock hours of supervised practicum prior to exiting from the graduate program. At least 375 of these 400 hours must be in direct patient/client contact and 25 in clinical observation. This requirement meets the number of hours specified for national certification by the Council for Clinical Certification in Audiology and Speech-Language Pathology (ASHA) and will meet or exceed the hours required for Kentucky Teacher Certification in Communication Disorders and for Kentucky Licensure in Speech-Language Pathology. Three indicators of our program’s effectiveness are: (1) employment rate of graduates, (2) Praxis exam pass rates , and (3) graduate program completion rates. On all three indicators, rates have been above 80% from 2014-2017 (see Tables below). The Master of Arts in Education (MAEd) Program in Communication Disorders is a two-year, full time program leading to eligibility for certification/licensure in Speech-Language Pathology by the American Speech-Language-Hearing Association, Kentucky Board of Speech-Language Pathology, and Kentucky Teacher Certification in Communication Disorders. Since this program leads to initial teacher certification, the criteria and guidelines set by Kentucky Education Professional Standards Board (EPSB; 16 KAR 5:020) must be met/followed. Application forms are available online at the Graduate Education and Research website,http://gradschool.eku.edu. The Communication Disorder admission requirements are described in the current EKU Graduate catalog: http://gradschool.eku.edu/graduate-catalog. Documentation of 25 clinical observation hours by August 1 of the application year hours as required by the American Speech-Language-Hearing Association for national certification. Letters of recommendation describing the applicant's potential success at the graduate level of study from three references. Applicants must provide valid email addresses for three references in the online application to the EKU Graduate School. A personal essay of approximately 500 words discussing personal and professional objectives. This essay will be scored to assess critical thinking, creativity, communication and collaboration. The essay should be submitted in the online application to the EKU Graduate School. Application forms are available online at the Graduate Education and Research website: http://gradschool.eku.edu/apply. Submit the completed application for admission with all required documents by February 15. 1. Candidates must review the Professional Code of Ethics for Kentucky School Certified Personnel established in 16 KAR 1:020 and sign a COE Professional Code of Ethics for Kentucky Declaration form. 2.Candidates must review the character and fitness questionnaire contained in Section III of the TC-1 incorporated by reference in 16 KAR 2:010 and sign a COE Professional Character and Fitness Declaration form. 3. EKU College of Education requires a state criminal history background check as a condition of admission. Under certain circumstances, a national criminal history background check may be required as a condition of admission. 4. Candidates must demonstrate understanding of professional dispositions expected of professional educators. Candidates must review and sign a COE Professional Dispositions Declaration form. NOTE: Based on your disclosure on any of these forms, an interview by the Professional Education Admission Committee may be required. 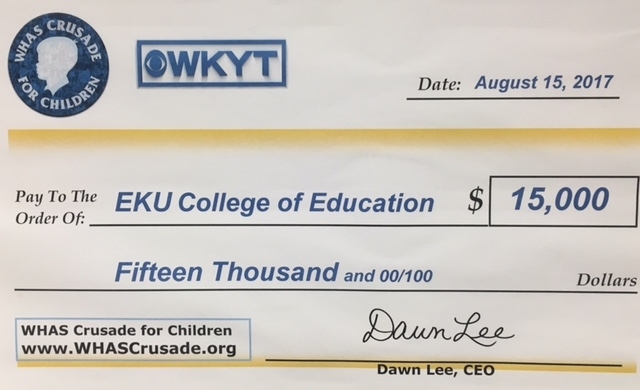 Admission to Eastern Kentucky University’s undergraduate program in Communication Disorders (CD) does not guarantee acceptance into Eastern Kentucky University’s graduate program in CD. Available spaces in the CD graduate program are open to applicants from EKU and other undergraduate CD programs. The most qualified applicants are admitted. These requirements may change; consult the current Graduate Catalog for updated information. The program is fulltime and completed in 6 consecutive semesters. CDS 720 Augmentative and Alternative Communication Systems. (3) I. An overview of various approaches to aided non-oral systems of communication. Various devices and symbol systems will be discussed. CDS 863 Motor Speech Disorders. (3) II. Prerequisites: admission to communication disorders and sciences program or by departmental permission. Study of the neurophysiology, assessment, and treatment of various motor speech disorders, including dysarthria and apraxia. CDS 867 Advanced Language Disorders. (3) A. Prerequisites: admission to communication disorders and sciences program or by departmental permission. Advanced study of formal and informal assessment and treatment approaches in child language without consideration of etiology. Emphasis on collaboration within the classroom, language and narrative sampling analysis techniques and use of language within the natural context. Minimum of eight hours field/clinical experiences required. CDS 873 Advanced Articulation and Phonology Disorders. (3) I. Prerequisites: admission to communication disorders and sciences program or by departmental permission. Study of the research and principles associated with symptomatology, etiology, diagnosis, and treatment of articulation and phonological disorders. Issues related to accent enhancement and modification, including assessment and intervention are explored. Minimum of three hours field/clinical experiences required. CDS 874 Graduate Practicum: Speech Language Pathology. (3) A. Prerequisite: admission to communication disorders and sciences program or by departmental permission. Supervised clinical practice in speech-language pathology. Must be retaken for a total of nine hours for the MA degree. Minimum of 145 field/ clinical experience hours required across three semesters. CDS 875 Adult Neurogenic Language Disorders. (3) II. Prerequisites: admission to the communication disorders and sciences program or by departmental permission. 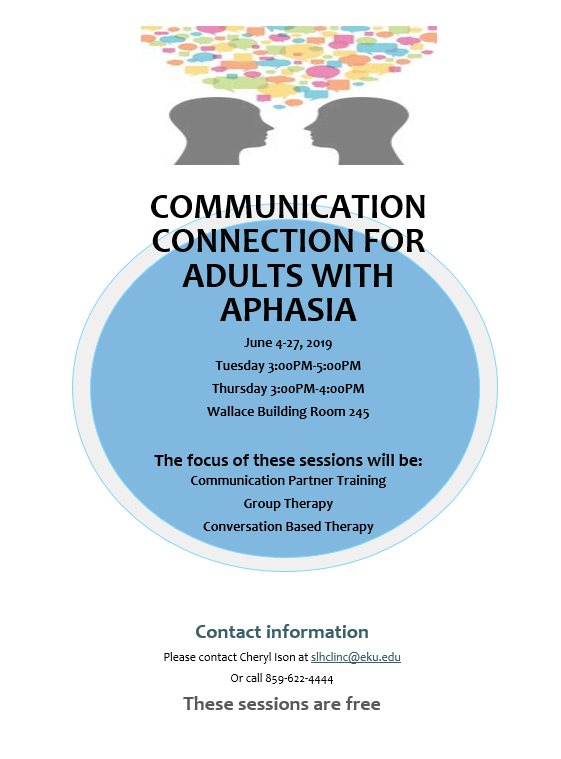 The study of the neurophysiological bases of aphasia classification systems, evaluation procedures, and treatment strategies. CDS 876 Advanced Voice Disorders. (3) I. Prerequisites: admission to communication disorders and sciences program or by departmental permission. Study of the research and bases of laryngeal phonation deviation, including etiology, diagnosis, and treatment of functional and organic voice disorders; assessment and use of clinical techniques with a variety of voice disorders. Minimum of three hours field/clinical experiences required. CDS 877 Advanced Fluency Disorders. (3) II. Prerequisites: admission to communication disorders and sciences program or by departmental permission. Critical study of research literature on etiology, theory, assessment and intervention strategies for preschool, school age, and adult fluency disorders. Minimum of two hours field/clinical experiences required. CDS 878 Diagnosis of Communication Disorders. (3) I. Prerequisite: admission to communication disorders and sciences program or by departmental permission. Diagnosis of language and speech disorders with emphasis on the use of dynamic assessment and comprehensive test batteries to describe the communication skills of children and adults. Profile analysis will be utilized to determine relative strength and weakness. Minimum of ten hours field/clinical experiences required. CDS 879 Dysphagia. (3) II. Prerequisite: admission to communication disorders and sciences program or by departmental permission. An introduction to dysphagia, including the anatomy, physiology, and development of normal swallowing, and evaluation, etiologies, and treatment of dysphagia. Minimum of five hours field/clinical experiences required. CDS 880 Research Methodology in Communication Disorders. (3) I. Prerequisites: admission to communication disorders and sciences program; or by departmental approval. Corequisite: CDS 878. Critical examination of research methodology in communication disorders and sciences. Students acquire the fundamental motivation, knowledge, and skills for conducting clinical and basic science research and for reading and critically evaluating research literature. Approved electives may be selected from areas such as CDF, CDS, EDF, ENG, EPY, NUR, OTS, PSY, and/or SED. Candidates who choose the Research Option will take CDS 899 for 3 hours and will take 6 hours of approved electives. CDS 899 Research Project/Thesis Option. (3) II. Prerequisite: CDS 880 or instructor approval. Completion of a research project related to a special population that may lead to a thesis and/or to a professional presentation and publishable paper. May be retaken to a maximum of 9 credit hours. Credit not awarded for both SED 899 and CDS 899. CDS 870 and CDS 898 or 897. CDS 870 Professional Issues in Communication Disorders. (3) A. Prerequisite: admission to communication disorders and sciences program or by departmental permission. Scope of practice, professional Code of Ethics, trends in service delivery, pertinent legislation, legal concerns, and other issues which impact the field of communication disorders will be examined. CDS 897 School Experiences in CD. (6) I, II. Prerequisites: CDS 874 (9 credit hours), completion of CD core courses and admission to student teaching. Supervised full-time clinical practice with a variety of communication disorders in selected school settings for a minimum of 70 school days. For CDS graduate students seeking certification in speech-language pathology. CDS 898 Externship in Communication Disorders. (6) I. Prerequisites: CDS 874 (nine credit hours) and completion of graduate core course work in communication disorders and sciences. Supervised 12-week, full-time clinical practice with a variety of communication disorders in selected externship sites. CDS 897 or 898 and Approved Elective. Candidates will complete one of the following exit requirements for the M.A.Ed. in Communication Disorders (CD): a thesis manuscript and oral defense or a written comprehensive examination. Thesis — The thesis is not required. However, candidates with special research interests are invited to explore thesis possibilities during CDS 880. Comprehensive Examinations — The candidate will have an opportunity to demonstrate professional growth through a written examination covering education and major program components. Candidates must complete 375 clinical clock hours before exiting from the graduate program. This requirement will meet the number of hours specified for national certification by the Council for Clinical Certification in Audiology and Speech-Language Pathology and will meet or exceed the hours required for Kentucky Teacher Certification in Communication Disorders and for Kentucky Licensure in Speech-Language Pathology. Clinical experiences for accruing clock hours are offered through CDS 874, 898 and 897. A maximum of 50 clinical clock hours accrued at the undergraduate level may be counted with appropriate documentation. A minimum of 25 clock hours of (documented) clinical observation must be completed prior to earning these clinical clock hours. Please see the 2014 ASHA Standards for CCC in Speech-Language Pathology for additional information regarding the academic and clinical requirements for certification in Speech Pathology. Students in the Communication Disorders graduate program must purchase the college student professional liability insurance prior to enrollment in clinical practicum courses. The Clinic Handbook outlines the clinical expectations, policies and procedures of the EKU Speech-Language-Hearing Clinic. Please see the EKU Speech-Language-Hearing Clinic website for additional information regarding our clinic and the clients you may treat as an EKU graduate student.